•"Say hello to my little chicken!" •A great source of Omega-357 and Anti-Uzidents. 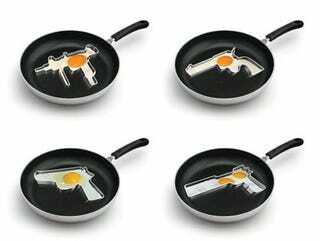 •Gun shaped eggs promote fowl play. •This is your brain. This is your brain shaped like an Uzi. •Shot in the yolk, and you're to blame. You give breakfast a bad name. •Nothing says "I love you honey" like a gun in the mouth. •Make one false move and I'll scramble your eggs. •That's what I call "insani-tasty."